Did you know McDonald's have it's own cafe now? 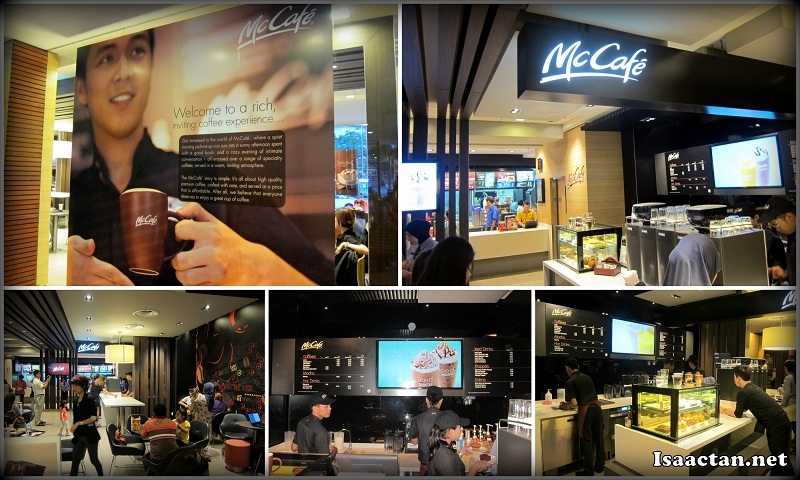 Aptly named McCafe, Mcdonald's officially launched its first McCafe in Kota Damansara today. I was one of the lucky ones to be able to check out and enjoy their cafe and cakes there this evening, and it was all good. It was my first time over at their branch in Kota Damansara, but I was mighty impressed with the modern deco and design with it's really cozy McCafe inside. The opening of this new McCafe is certainly welcomed by today's crowd, now you get to have your favourite McDonald's meal while chilling with their specialty coffee made using high quality Arabica beans at a surprisingly affordable price. Here's some coffee beans for you! "This new premium coffee experience that McCafe offers is just another example of how McDonald's evolves to meet consumers' changing lifestyles and palates." "The launch of McCafe in Kota Damansara will see 10 more McDonald's restaurants be fitted with McCafe counters by the end of 2012 and another 50 new outlets slated for 2013. The Company is targeting an aggresive expansion plan for McCafe with a nationwide reach." "McCafe offers an extensive menu of premium quality beverages such as cappuccino, latte, macchiato, espresso, hot chocolate and frappe together with a selection of pastries, cakes and muffins. Beverages range from only RM4.50 for a latte or cappuccino and only RM6.20 for a frappe, available from 7am to 12 midnight daily"
How's that for starters, which were the cheese cakes, namely the Blueberry and Mocha Marble Cheese Cake. The price was on the high side, but I'm glad to say it was worth the price as the cakes were really well made. Personally I love cheese cakes, being a frequent customer of Secret Recipe, and the cakes in McCafe was just as nice if not better. Some more cakes and brownies for the sweet tooth in me, as I dug into McCafe's Brownies and Black Forest Cake. Now I have to comment on their Black Forest Cake, as I could actually taste all the ingredients inside. No complaints on the brownies as well. If the cakes aren't filling enough, why not go for McCafe's huge muffins, ranging from Banana Walnut Muffins to their Double Chocolate Chip and Carrot Raisin Muffin. These muffins were a real mouthful, larger than your average everyday muffins, filling enough to satisfy the big eater in you. Of course, coming to McCafe without having their coffee would be a total miss, so we got to sample their premiu 100% Arabica coffee beans grown in the hills of Central and South America while we were there. The beans are medium roasted to perfection, then freshly ground with every order to maintain their flavour and consistent quality. I liked the cute "M" shape they managed to draw on their cute Cappucino drinks as well. So there you have it, McDonald's First McCafe finally opens in Malaysia. If you're around the vicinity of Kota Damansara, do make a stop here, if just to experience what our neighboring country have enjoyed all this while, the McDonald's McCafe. wah, the price of the coffee really cheap leh. almost half of the price of starbucks. Very interested in the coffee. Need to see how it tastes like since it's quite affordable! Wow McCafe :) shall try it one day! why a fast food restaurant wanna have cafe? ok, get more monaaayyyy...hhiihih.. Ah!!!! I would love to try this...and hang out over a cuppa! Not into McD's, burgers and stuff...never been for years - this one should be good to drop by for tea. Take me next time I go KL, ya? Too bad I can't drink coffee. The cakes really looks cheapo, but it might be worth trying. can't judge them by the look. I tried the ice blended coffee in McCafe in Bali, Indonesia but i felt that the taste could not match the satisfaction in Starbucks coffee. Sure its cheaper, but there no kick in it. Is McCafe open 24 hours?